Inglis graduate Fiveandahalfstar continued the dominance of Australian-bred three-year-olds in the nation’s weight-for-age feature events this year when holding off all challengers to take out today’s $2.25 million Group 1 ATC BMW Stakes over 2400m at Rosehill Gardens. Fiveandahalfstar ($20,000 2011 Classic, 3g Hotel Grand-Cryptic Miss) led from start to finish under top Sydney hoop Hugh Bowman, with the tough galloper outstaying all his rivals which had thrown down the gauntlet from the 800m mark. Bowman was full of praise for Fiveandahalfstar (pictured), which joins All Too Hard, Super Cool and Pierro as Australian-bred three-year-olds to win Australian Group 1 weight-for-age events in 2013. “He is a great horse, he is a proper horse, he has really furnished in to a top line thoroughbred, his form speaks for itself and he thoroughly deserved the win,” said Bowman. "I was just starting to build 100m prior to when Kelinni strode up alongside us, and he did pour the pressure on but this horse is not a sit and sprint type, I just held onto him and let him get through his gears. And you saw him fight when Silent Achiever came up along his inside. It’s a great feeling and a privilege. “He'll go around next week [in ATC Derby] and he'll do it again,' Bowman said. 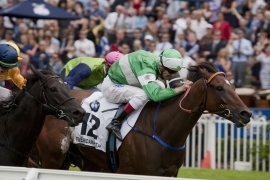 Today’s was Fiveandahalfstar’s second Group 1 win adding to his victory in last year’s $1.5 million Victoria Derby. The star three-year-old has now earned $2.6 million for his owners Anthony Cummings Thoroughbreds P/L Synd (Mgr: A Cummings), J Cuvelier, Ms S Wong, H Dyball & Bangaloe Stud Synd (Mgr: Miss J Ritchie). Australian-bred three-year-olds have now won the Group 1 ATC BMW Stakes, VRC Australia Cup, ATC Canterbury Stakes, ATC George Ryder Stakes, MRC C.F. Orr Stakes and MRC Futurity Stakes at weight-for-age level since February. The yearling half-brother to Australia’s top rated three-year-old and Inglis Easter graduate All Too Hard is set to be offered as Lot 131 at next week’s Inglis Australian Easter Yearling Sale in Sydney. Fellow Inglis Easter graduate Exceed And Excel wrote himself into the record books today as the sire of the first, second and fourth placegetters in the world’s richest two-year-old event, the $3.5 million Group 1 ATC Golden Slipper Stakes. Eight yearlings by Exceed And Excel are set to be offered at the 2013 Inglis Australian Easter Yearling Sale on 9, 10 and 11 April. Also catalogued for sale on Tuesday, Wednesday and Thursday are eight yearlings by Commands and 24 by Lonhro, which sired the winners of the Group 1 ATC Inglis Queen Of The Turf Stakes and George Ryder Stakes respectively on Saturday.